Verra Grande flows south from Breithorn, in the Monta Rosa group of Italy. The glacier is 3.5 km long extending from 4000-2700 m. Carnielli (2005) noted that this glacier retreated 816 meters from 1914 to 2001. There were two period of advance 1914-1921 and 1971-1985. Retreat was most rapid from 1934-1956 and 1991-2002 (Carnielli, 2005). 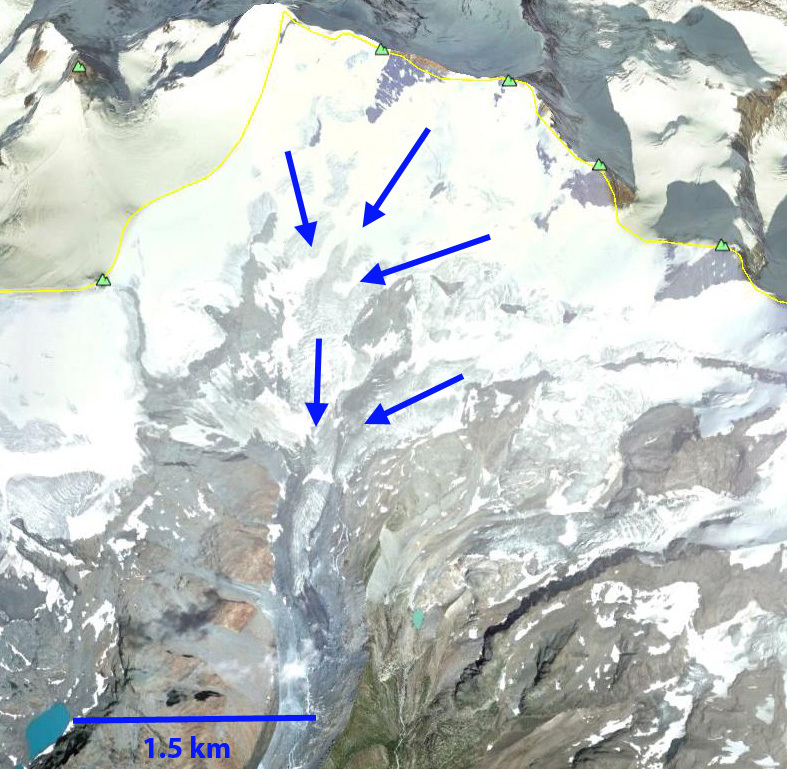 Here we examine the change in this glacier from 1990 to 2014 using Landsat imagery. 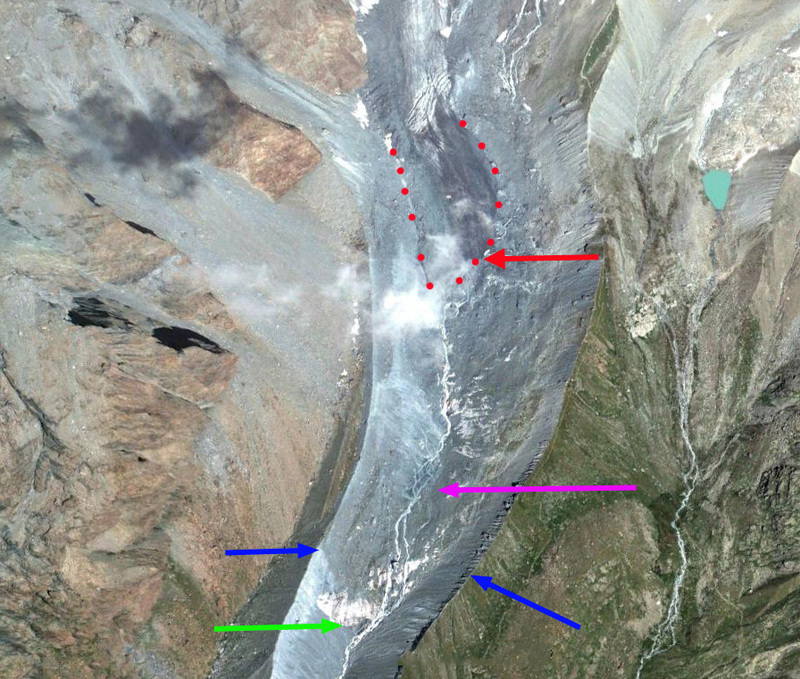 In 1990 the glacier terminated at the pink arrow, which is at the same location in each image. 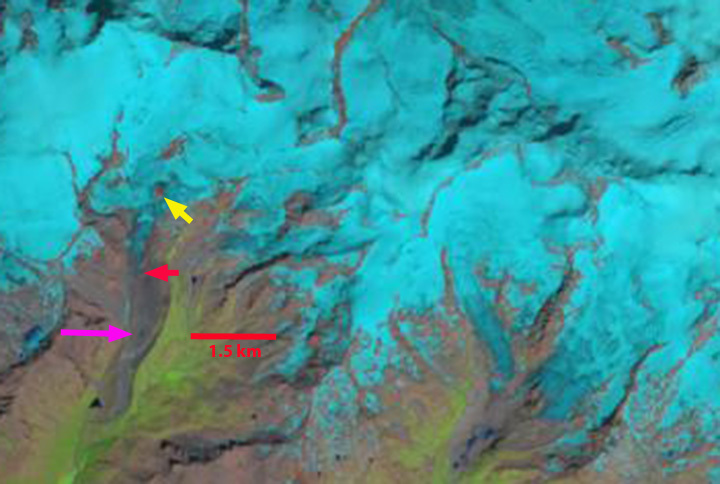 At the yellow arrow which is in an icefall in the upper ablation zone, there is complete glacier cover. The red arrow is at the 2014 terminus location in each image. 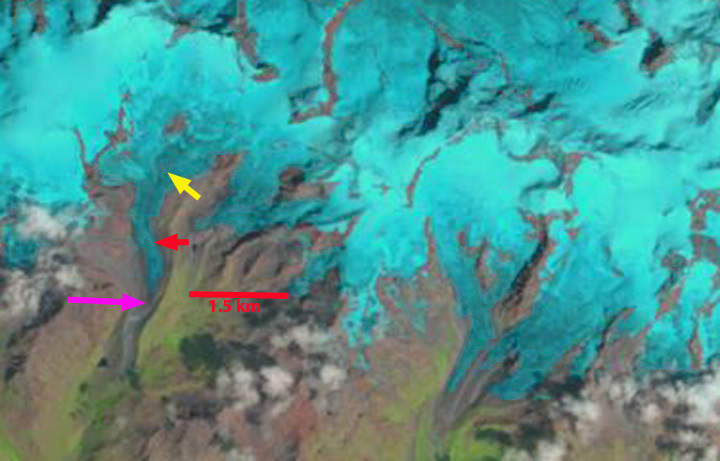 By 2013 at the yellow arrow an area of bedrock has been exposed as the glacier has thinned during a period of retreat. 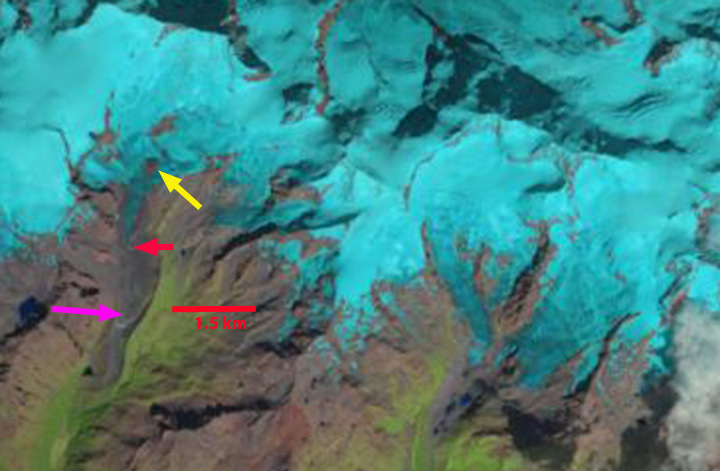 In 2014 the glacier has retreated to the red arrow a distance of 850-900 meters from the 1990 terminus location, pink arrow. The snowline is high at 3500 m above the new bedrock area at the yellow arrow. A close up of the terminus from Google Earth in 2009 indicates the Little Ice Age moraines, blue arrows and the debris covered nature of the terminus, red dots. The retreat is similar to Sabbione Glacier and Lobbia Glacier. The Italian Glacier Commission conducts an annual terminus survey, with the most recent completed survey results posted from 2012. In 2012 there were 124 glaciers retreating, 3 advancing and 5 changed by less than two meters. This ubiquitous retreat is leading to the separation of some glaciers, development of new lakes and loss of others in the Italian Alps.